During his tenure as U.S. Attorney for the Southern District of New York, Preet Bharara earned a reputation as one of “the nation’s most aggressive and outspoken prosecutors” (The New York Times), with a special focus on big banks, terrorists, hedge funds and public corruption. 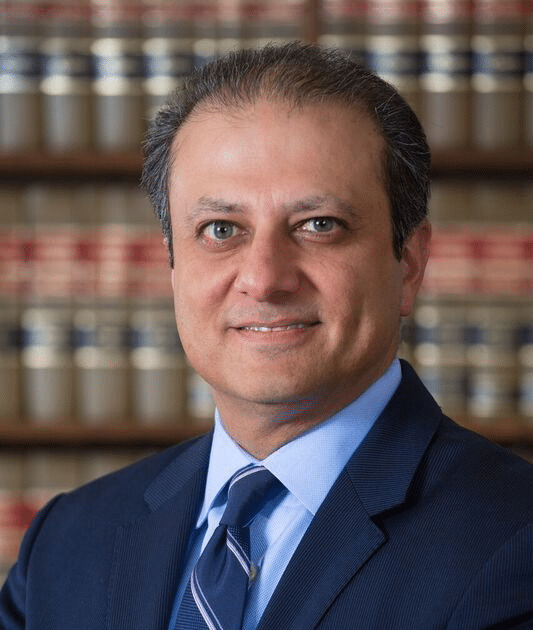 Since leaving the U.S. Attorney’s office, Bharara has kept busy as a distinguished scholar in residence at the NYU School of Law, as the creator of the podcast Stay Tuned with Preet, focusing on justice and fairness, and as an outspoken Twitter presence. The Q&A will be moderated by Soterios Johnson, UC Davis Director of Humanities, Arts and Cultural Partnerships. Before joining UC Davis, Johnson was a journalist and local host of NPR’s Morning Edition on WNYC in New York City. During his 22-year tenure at WNYC, he reported on the news of the day and produced features and interviews on politics, education, science, arts and culture.